Amongst the photographs of Methodist chapels collected by Keith Guyler there is one taken in 1999 labelled Cheadle, Charles Street. It is indeed in Charles Street, but it turns out to be not the Primitive Methodist chapel but the Sunday School to the former Wesleyan Methodist chapel, almost directly opposite. On Ordnance Survey maps from 1880 it is labelled Sunday School (although that label is not directly on the building and could relate to other buildings in Chapel Street). 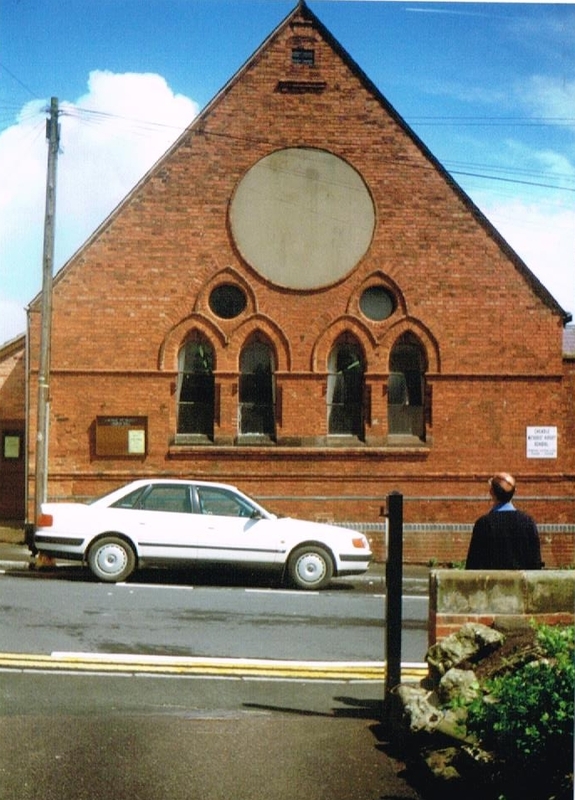 The former Wesleyan Sunday school was built behind the former Wesleyan chapel which had a frontage in Chapel Street. In April 1962 the trustees of the Wesleyan Chapel on Chapel Street, Charles Street ex Primitive Methodist Chapel and Zion United Methodist Church on Coronation Street, voted unanimously for the union of the three chapels. In 1967 a new church was opened – free of debt – on the former Wesleyan site in Chapel Street.